An ongoing album of interesting insects from the province of New Brunswick, and elsewhere, as well as anything that catches my eye. These two dragonflies and the sphinx moth were found last week in Fredericton. 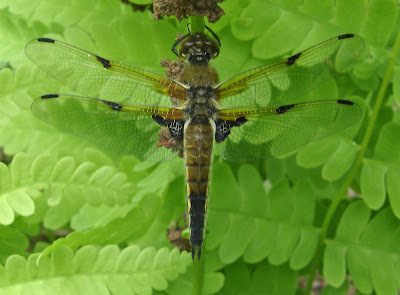 The black one is a Dot-tailed Whiteface (Leucorrhinia intacta) and the other is a Four-spotted Skimmer (Libellula quadramaculata). The moth is a Twin-Spotted Sphinx (Smerinthus jamaicensis). 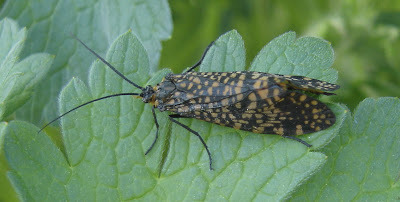 This is an adult of one of the large caddisflies (Family Phryganeidae, Order Trichoptera), very likely the species Agrypnia. It was sitting on a large cranesbill geranium in my front yard, and allowed me to hold it in my hand. The larvae of this family live underwater and build smooth tubular cases from which they feed. 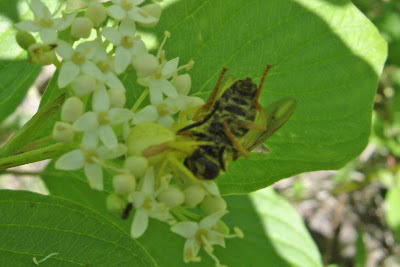 This Goldenrod Spider (Family Thomisidae) has ambushed and captured a bee that wandered innocently onto this flower. This common spider lies in wait in white or yellow flowers, and changes colour to match them. 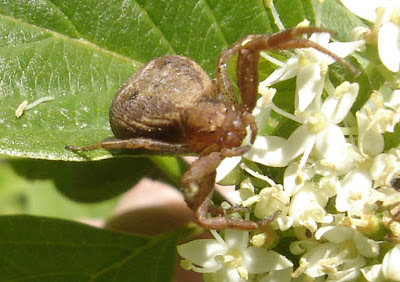 The brown spider is another crab spider. It is sitting in wait ready to grab whatever comes by. Yes, this is a moth! 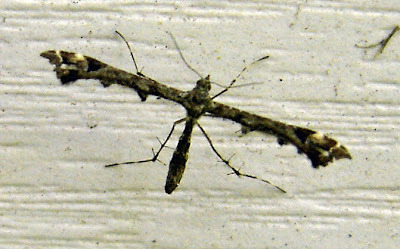 These are plume moths (LEPIDOPTERA: PTEROPHORIDAE), found near my front door on this June and last July. 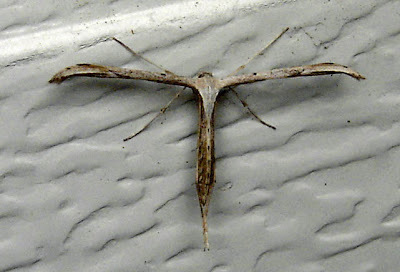 The characteristic T-shaped resting posture makes them easy to identify as plume moths, but getting them to species is much more difficult. Top photo is probably the Geranium Plume Moth (Amblyptilia pica); bottom photo is the Morning-glory Plume Moth (Emmelina monodactyla). Thanks to an expert at the Moth Photographers Group for the ids (see comment). This is a picture of the TBM Avenger on display at the Woodmen's Museum in Boiestown, NB. Avengers are medium-sized torpedo bombers (hence the name TBM) that operated from aircraft carriers during the last years of WWII. The name Avenger comes from the US response to the bombing of Pearl Harbour. After the war, many surviving TBMs were converted to fire bombers and spray planes. Many were contracted from all over the US and Canada by Forest Protection Limited of Fredericton for spraying forests to fight the spruce budworm and other species of defoliating insects from the late 1950s to the mid 1980s. FPL once owned the largest fleet of Avengers in the world, but has only three left, which are used now as fire bombers. I am compiling a history of the Avengers that came through New Brunswick during that period, which will lead eventually into a history of FPL. 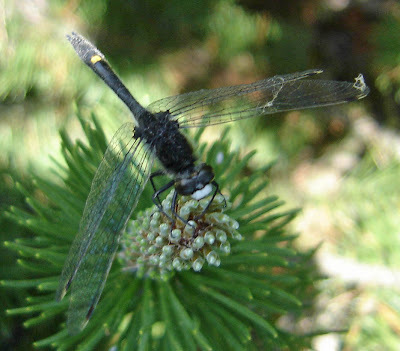 I became passionate about insects when I was photographing insects on Christmas trees for a Canadian Forest Service publication Pests and Diseases of Balsam Fir Christmas Trees (not yet published). My current project is a history of the TBM Avenger spray aircraft used in New Brunswick from the late 1960s to the 1990s, for Forest Protection Limited.